Moringa oleifera is a fast-growing, drought-tolerant “super-food” tree. It produces harvestable leaves within just six months, and can thrive even on degraded land. It is known in Africa as the “never-die tree” or the “miracle tree” for its extraordinary properties and range of uses. Moringa leaves are 30% high quality protein, and are among a handful of vegetables that contain all 9 essential amino acids (18 in all). 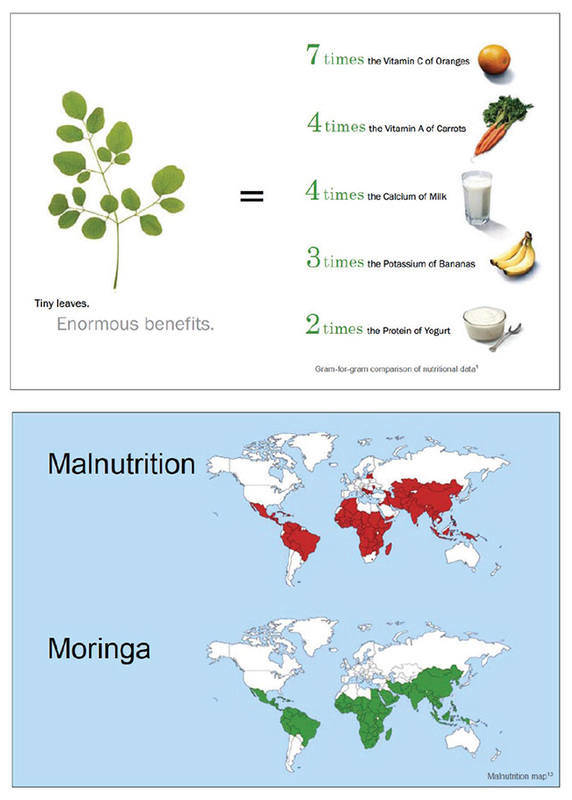 Added to staple foods like bread and flour, moringa could help hundreds of millions of malnourished people. Moringa contains an extraordinary array of micronutrients, vitamins and minerals needed for a balanced, healthy diet. Dried moringa leaf powder has registered the highest ORAC (Oxygen Radical Absorbance Capacity) score ever recorded, topping all other antioxidant superfoods such as Acai berries, green tea, and red wine. The dried leaf powder has been increasingly used as an ingredient in processed food products sold in natural product outlets like Whole Foods. Moringa’s raw leaves, pods, and seed have been a traditional food staple in many tropical countries. The nutritional, therapeutic, and disease-preventative properties of various moringa components have been well-documented at universities and labs around the world. Moringa has been shown to be a glucose-regulator and has been used in traditional medicine for diabetes. Moringa seeds yield high quality cosmetic and cooking oil, and are a natural bioflocculant and anti-microbial for water treatment. Moringa has been used as a weaning food for infants, and increases lactation in nursing mothers. Moringa leaves and seedcake improve milk productivity and weight gain in livestock when added to fodder. Its leaves contain a powerful plant growth hormone. Green World Ventures will be working with major U.S. university food science departments and leading food scientists in Africa to utilize the tree’s maximum value to people and planet.